On 4chan, certain things are inexplicably "word filtered" to other things. In this example, the number 7 gets changed to "over 9000". Now obviously the intention here was to list the numbers 0-9, thus giving no chance that the last numeral in the post (No. 123668657) would be anything but what he listed1. However, he forgot about the word filter and through a strange twist of fate, the post ended in a 7. Against nearly impossible odds, the truth that there is no God still came out. 1: Since there are literally hundreds of posts every minute (or even second at times), it is impossible to actually know what number your post is going to end with. It's essentially random. @ Anonymous (#1): I think the wordfilter was first put in place because people were talking about 7 chan. But yeah, the "over 9000" thing is a reference to Goku's power level in Dragonball Z. Though I've never actually watched Dragonball Z. There is a one in ten chance. That's nowhere near being nearly impossible odds. 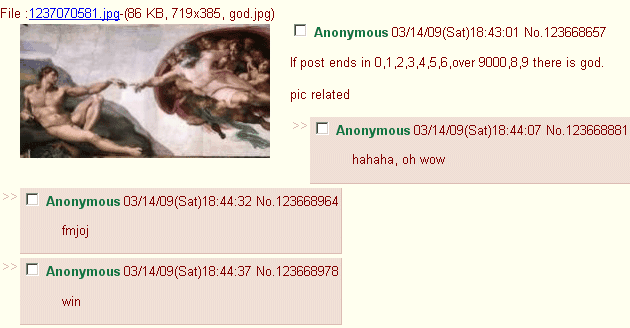 @ Anonymous (#3): You've also got to factor in the chances of the poster making the post to begin with, and forgetting about the old '7' word filter. But this was a comical point anyway. Not to be taken seriously. But what if he's using a script, like the guy who got the 440 millionth post? It could be on purpose.